Yesterday was December 1st. I always love the first day of a new month because it reminds me that life is full of new beginnings, and this month that idea was particularly welcome! With three teenage children, life is always busy. 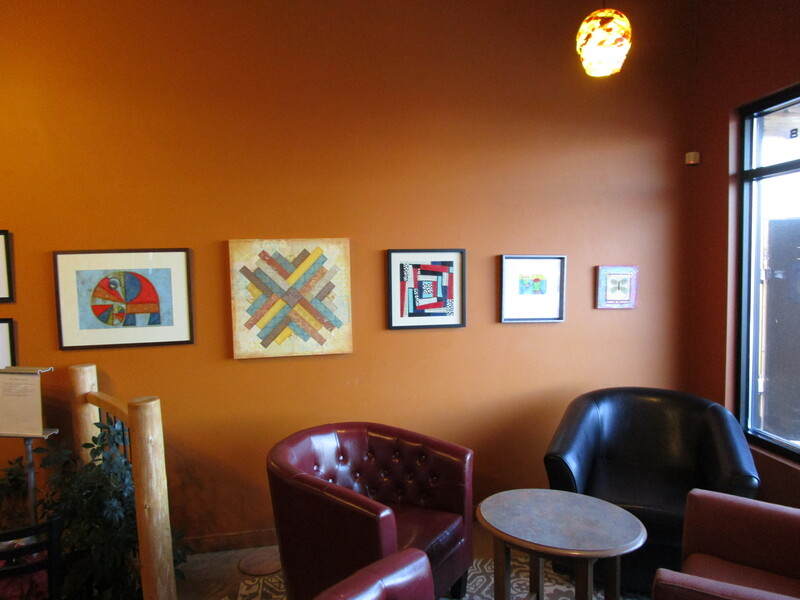 Last month was particularly busy as I was preparing for my December art show at our local Dunn Bros coffee shop. Yesterday was installation day, so I wanted to share a few pictures, as well as a couple pieces that I’ve not yet featured on my blog. I created “Fibonacci’s Elephant” this past summer after reading about the many ways the Fibonacci pattern, also known as the golden ratio, occurs in nature. The symbolism of the elephant was also deeply inspiring to me. I created this piece after reading a book about the quilters of Gee’s Bend. One artist friend commented that it looks a bit like Russian Constructivism. 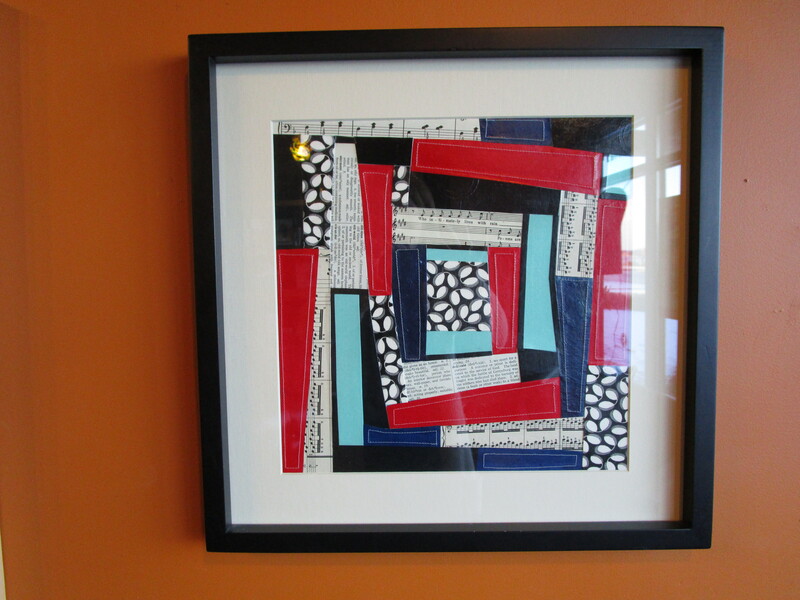 This piece contains vintage fabric, hand-painted papers as well as vintage paper and sheet music. Since the art featured in this show is a compilation over several months and didn’t have a single, unifying theme, I chose to call the show “My Favorite Things”. 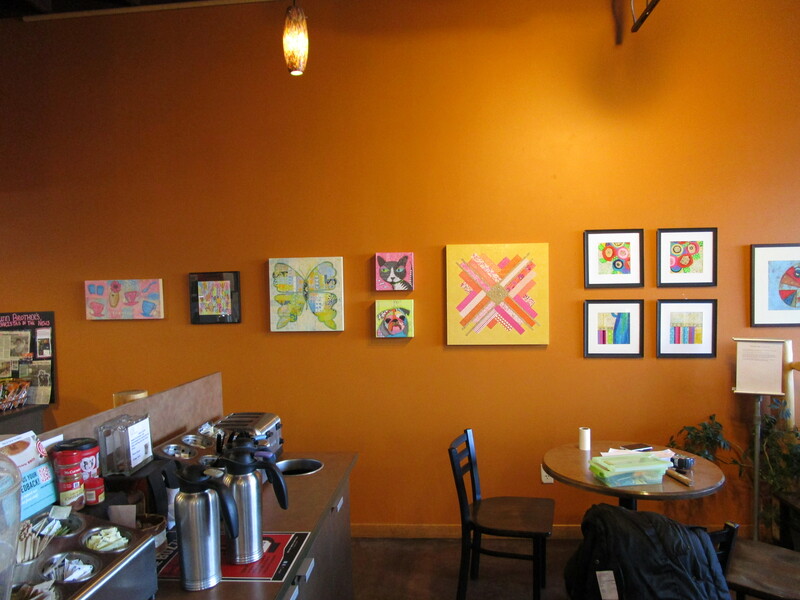 The show is up through December 30th at Dunn Bros, Bemidji, MN, with an artist reception this Friday, December 5th from 5-7pm. Music generously provided by my good friend, cellist, Sonja Connell and her accompanist/father, Jay Carlsgaard. I hope local friends can attend. Thanks for visiting my blog. I hope your December is off to a great start, too! Sounds exciting. Best of luck. And I love the elephant. !!! Thank you, Claudia. I’ve loved seeing your art, too. Thanks, also, for the good wishes. Blessings to you, as well. congrats, so exciting for you. What a great way to be stretched as an artist. Thank you, rockmelon (Rochelle, right?). You’re right, it is definitely a stretching experience. Gorgeous pieces. That elephant is delightful! I enjoy messing about with Fibonacci poetry. I have a draft post in my blog with a poem that has been sitting there probably 6 months. Must finish that sometime. Thanks for following my blog. Yours looks like a great place to hang out too. Thank you, Yolanda. I will definitely check out your Fibonacci poetry. It sounds interesting. Loved visiting your blog, too. Have a great day! Thank you, Beth. The show was a lot of fun. I only sold one piece, with two people expressing interest in other pieces but not purchasing. Learning that it’s part of the gig! Thanks again and have a great day! Love your Elephant Art! How did the December art show go for you? 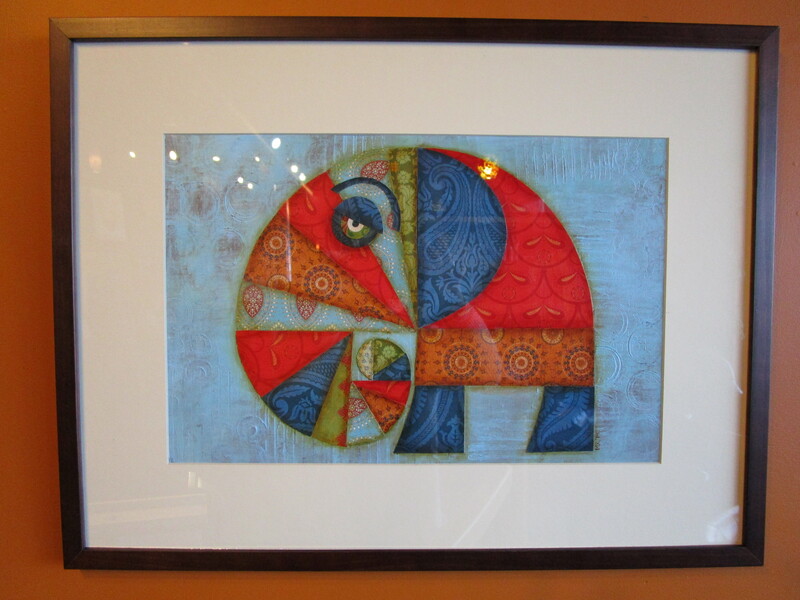 Is the “Fibonacci’s Elephant” piece for sale? If so, please let me know! Thank you! Yes, Fibonacci’s Elephant is available. I sent you an email with dimensions and details. Thanks for your interest. Have a great day!